As my Dad say, “Paper and paint make it what it ain’t,” and boy does that apply to golf carts! When it comes to golf carts, anything goes. It’s nice when the things you own can reflect your personality and style, and that is easy and fun to do with a golf cart. So, once you purchase the cart you want, why not personalize it with great accessories that scream YOU? If you have a more conservative nature, you might consider adding comfort items – ranging from built-in coolers, to plush carpeting, fancy cup holders, extra seating, a roof rack, cooling fans, stylish seat covers, a GPS unit or stereo. If your older parent or teenager will be enjoying the cart, safety may be your main concern. You can add a host of safety features, including rearview mirrors, brake lights, safety belts, turn signals, reinforced windshields with wipers. There are even headlights for night driving. Okay, so now let’s talk about the fun stuff! People deck out their carts with lights and antlers for the holidays, plastic pink flamingos for that “Florida feel,” stars and stripes on the 4th and so much more! Eyelashes can transform your headlights into eyeballs. Fender flairs, custom tires and rims can add a racer’s edge. Or wrap it in camo if that’s your thing. You can even paint it hot pink and adorn it with decorative jewels if you like things on the girly side. 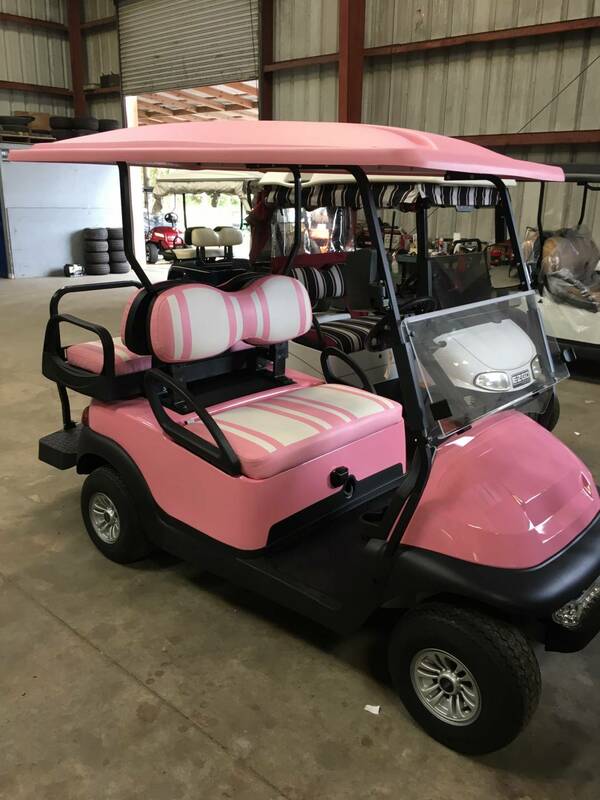 However you choose to decorate or accessorize your golf cart, Gulf Atlantic Vehicles can make it happen. Just like a beautifully cultured pearl, Gulf Atlantic Vehicles – New Smyrna Beach’s trusted source for golf carts and golf cart accessorizing since 1965 – is a seaside gem. Our service department is fully staffed with professional, expertly trained technicians and our accessories inventory is enormous! Just visit our convenient location on Pioneer Trail or call us at 386-427-9778.Gulf Atlantic carries golf carts in all the top lines and offers hundreds of options and accessories to create the perfect custom vehicle for you.